Formed in 1966 by breaking away from former Punjab, the Green Land of India, Haryana is often praised as the most fertile state in India. Though Haryana still shares its capital with Punjab, it is a world apart with its lush greenery and abundant wildlife. All of this has never deterred the state from becoming one of the popular locations for development and massive residential avenues around NCR. For those of you planning to take up a place for rent in Gurgaon or rest of Haryana, this page will prove to be a lifesaver. We’ll briefly discuss the know-hows of creating and registering a rental agreement in the state of Haryana. The conventional way to draft a rental agreement would be to approach a lawyer and telling him your requirements. The lawyer would then prepare a rough draft including details of parties involved and the property up for rent. Clauses requested by both parties would be included in the draft and the final version will be reviewed by both Tenant and Landlord. If found satisfactory, the deed is then printed on stamp paper of due value and the parties involved will place their signatures along with signatures of two witnesses. The document is then registered at the local Sub-Registrar office. 1.5% of the annual rent+deposit, if the term of the lease is below 5 years. 3% of the annual rent+deposit, If the term of the lease is 5-10 years. No emphasis is needed on the importance of paying the appropriate Stamp Duty. In case a dispute arises and Court finds out that the required Stamp Duty was not paid, parties involved may have to pay up to ten times the value of normal Stamp Duty. e-Stamping in Haryana – e-Stamping is a fairly new concept in Haryana. It was introduced recently, March 2015 to be precise. This e-stamping system is yet to replace the conventional stamp papers sold by treasury /banks. This e-stamping system is run by the State Govt. and is different from the one operated by Stock Holding Corporation of India (SHCIL). Currently, the traditional stamp papers are going to be more widely available than their electronic counterparts. Handling legal matters can be tedious, more so if they were done in a botched up manner. Registering a document with the local Registrar office provides you the following benefits. Aadhar card or the receipt received while applying for it, if the person is Indian. If the person is a foreign national, then his/her original passport is required. If one person represents another person for the registration, then a Power of Attorney deed shall be presented. 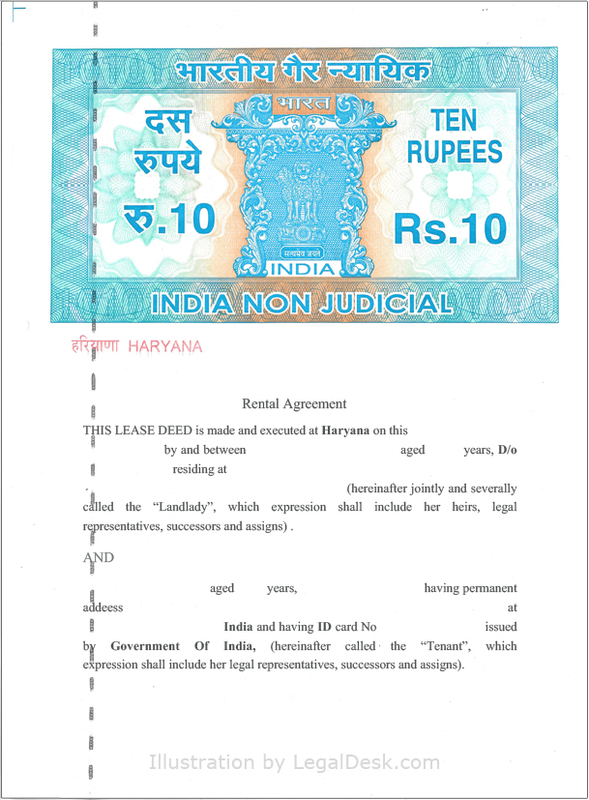 Like in most states in India, Haryana too has three types of rental agreements. 11- Month Agreement – Such agreements are often signed for residential purposes alone. The duration is typically for 11 months. As its less than a year, most parties skip registration and/or notarization. Such agreements can be renewed with the consent of both parties at the end of the term. Commercial Agreement – Signed almost exclusively for business purposes, commercial leases vary greatly in both structure and terms. They are often signed for longer periods of time and the formalities are much different from that for residential leases. Long Term Lease – Signed for residential needs, long term leases often quote years as the term of the lease. They involve larger sums of money and do not involve monthly rents in most cases. No matter how much you trust your tenant/ owner, omitting important clauses in your rental agreement is like leaving a ticking bomb unattended. Here’s a list of clauses you must never forget to include in your rental deed. Rent, deposit and maintenance charges: These must be discussed in advance and mentioned clearly in the agreement to avoid future confusion. Permission to keep pets: Some Landlords dislike the idea of animals inside their property. Tenants are advised to discuss this with the owner before you sign the deed. Consequences of late payments: When the Tenant refuses to make payments on time, the Landlord is free to charge a penalty for each day that the payment was delayed by. This penalty should be spelled out in the contract to ensure that the Tenant is aware of it. Food habits: Landlords belonging to some religious groups sometimes have difficulties accommodating a Tenant who consumes non vegetarian food or alcohol or other particular items. If there is a such a condition, the Landlord must make sure that it is included in the deed. Lock-in period: Lock in period refers to minimum duration in which neither party can terminate the contract. Overstay: If the Tenant continues to occupy the premises even after the contract term is up, the Landlord may find it difficult to evict such a Tenant. To prevent this, include the overstay clause which will clearly spell out the consequences of overstay. Many a things are overlooked by both tenants and landlords while entering into a rental agreement. Most often, they result in all kinds of epic disputes and unpleasant scenarios. To avoid most of them, here’s what you need to pay attention to. Authenticity of the owner – Middlemen often meddle with property matters and may pose as actual owners. Make sure that the guy pretending to be the owner actually has the documents to prove it. Receipts – Collect receipts for whatever payments you make. Starting from the token advance to monthly rent, everything must have a receipt, otherwise you will have nothing to prove that you did pay such charges to the owner. Painting and maintenance – It is a common practise to deduct painting charges from the deposit amount at the time of vacating the house. However, if the house was not freshly painted while it was handed over to you, the landlord does not have the right to deduct painting charges from you. Be aware of this fact. Registration – As discussed earlier in this article, the importance of registering the agreement cannot be overlooked. Unless your deed is registered it can only serve as collateral evidence should a dispute arise. Notarization of Rental Agreements – Contrary to popular belief, notarization and registration are two very different things. A notarized document is not the same as a registered document. That said, notarization is not mandatory. Security Deposit – Security deposit is usually collected in advance is a sum that is refundable. It is usually returned to the tenant while he/she vacates the premises and hands over the keys. The norm in Haryana is collect 2-3 months of rent as security deposit all though some landlords may ask for more. The trend varies from city to city. Big cities like Chandigarh, Faridabad, Gurgaon etc may demand higher amounts. Smaller amounts may be charged in cities like Panipat or Yamunanagar. LegalDesk offers excellent pre-drafted, lawyer verified, ready to use rental agreements which can be accessed from anywhere in the world. You can simply log on to our website and create one in a matter of minutes.